Below is a list of services we offer and descriptions of each. If you have any questions regarding specific needs, please feel free to contact us. Below, you'll also find just a few samples of our work. 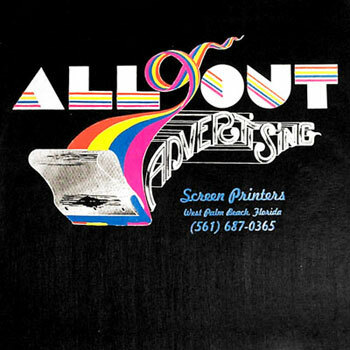 Textile Screen Printing - This is our specialty. Utilizing 3 six-color screenprinting presses, plastisol ink, and 19 years of experience, our projects come out cleaner, last longer, and create the impact you're looking for. Turn around time on screenprinted textiles is 5-7 days (rush service is available). Prices vary from project to project, but check the pricing section for setup costs and printing fees for standard shirt designs. Embroidery - We've teamed up with several embroidery shops in Palm Beach County to offer a wide range of services for large-run projects, short-run projects, one-color to full-color projects, as well as specialty items like hats and towels. Design Services - Need promotional shirts for an upcoming event, but have no art for them? Maybe you have the art, but it needs to be scanned and cleaned up digitally. We can take care of that. Most design services are completed while-you-wait, keeping you directly involved in the process and ensuring your approval on the final product. Specialty Advertising Items - Want some cheap advertising? Try ordering letter openers, coffee mugs, can coolies, keychains, magnets, licence plates, pens, bumper stickers and more, printed with your company logo. We can order just about any promotional item you can think of. Here in the shop, we have a sample of a print we did that lasted longer than the shirt it was printed on. The ink remains and the shirt has long since disintegrated after 15 years of washing and wearing. That's how long our prints last. We also offer heat-transfer printing as a full color option, and number printing for team uniforms. Call for details.